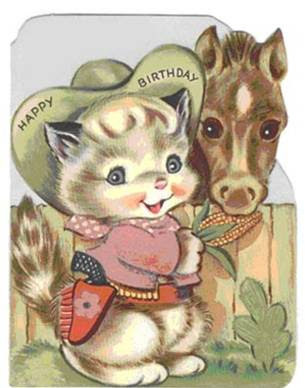 Moonbeam: HAPPY BIRTHDAY TO POOKY! It is my dear sister's birthday today, and I wanted to give her a shout out. YO! Note to pooky: I think you're NUTS for not eating cake today, but whatever floats your boat. Perhaps you could help yourself to some corn like this here horse. Golden and deelishus. I hope a ton of fun stuff happens today - and go see Iron Man!! It's freakin' awesome. I love you! Pooky, Happy Birthday from your brother-in-law! Hey there! I just found your cute blog, and I wanted to say hi! :) I hope you're having a wonderful day, and that your sister is having a wonderful birthday! !